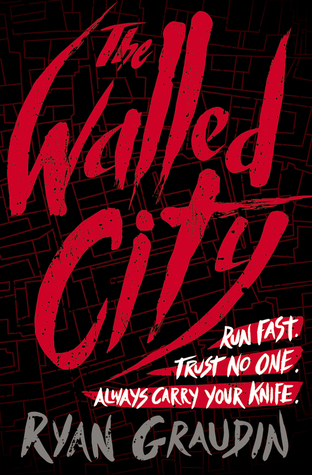 The Walled City is, to be put simply, a teen thriller. I really have to applaud Ryan Graudin on his imaginative and interconnected storyline. Each new chapter kept you yearning for the next one, and as you found out more about the characters, you figured out plot twists before the rest of the book's characters did, which made you keep reading, waiting for them to discover what you had. This very interactive storyline really keeps readers interested in the book. But a storyline can only do so much, and although Graudin fully succeeded with the plot, the writing itself was mediocre. When compared to other books, it was...lets just say it won't be remembered for its prose. However, the intriguing thing about this book that everyone is buzzing about (ha--and its a BEA Young Adult Editor's Choice Buzz Book! Nudge Nudge! No? Okay.) is the fact that it is very hard to classify--it's not fantasy or dystopia, two of the biggest genres in current YA Fiction. But it's not really historical fiction either, even though the Walled City was a real place. That was an interesting thing to think about as I read it, which further pulled me in. The Walled City is a grimy, dark place full of criminals, gangs, homeless children, drugs, and brothels. The story follows the tales of three teens, each running to or from some evil. The first teenager is Dai, a 17-year-old boy hiding from the police, being persecuted for a crime he didn't commit. He's searching for the one dangerous item that could bring him his freedom. Only problem? He has to steal it from one of the most powerful drug lords in the city. Jin is a young girl disguised as a boy to keep herself from being taken into the brothels. She's spent the last two years looking for her older sister, sold into prostitution by their very own father. Finally, Mei Yee is a young woman taken away to the brothels against her will and sentenced to a life of prostitution, with no hope of escape. She's watched countless attempts and seen every single girl who's tried to free herself brought back and punished. Will she ever get out of her miserable life? So if you want a really engaging, page-turning read, I would definitely recommend The Walled City. But if you're extremely bookish like me, and get hung up on writing and sentences that aren't that great--well, I'd still read it, but you have to let go of that part of yourself and focus on the plot. If I had to pick, I'd say look for this book in November 2014 from Little, Brown. Whether you like it or not really depends on what kind of reader you are!